Friday 11th March 6 pm, Presbyterian Community Centre, Tenby St. Contemporary international migration to the regions: it is not just an Auckland story. Professor Richard Bedford QSO, FRSNZ, President of the Royal Society of New Zealand. There has been a lot of media comment over the past year about record levels of immigration to New Zealand, and the impact this might be having on demand for housing in Auckland. Auckland is certainly the recipient of a lot of migrants on temporary work and study permits as well as those seeking residence. But other parts of New Zealand are also experiencing influxes of migrants, including the Queenstown-Lakes region. In this presentation I will review some of the recent statistics on immigration and in the process question some of the current focus on Auckland as the premier destination. 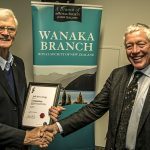 As the new President of the Royal Society of NZ, Professor Bedford would also like to use the opportunity of meeting with Branch members and to talk a little about some of the things the Society is doing as it approaches its 150th anniversary next year.